A Estrada 47 :: Movie Information :: RabbitTV GO! 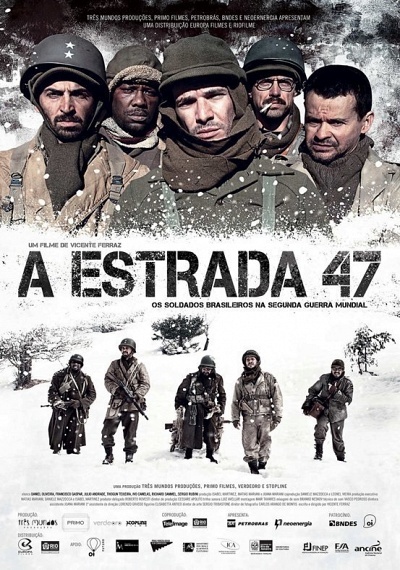 During the freezing Italian winter of 1944, a mine detecting squad from the Brazilian Expeditionary Force find themselves lost in the middle of no man's land after a collective panic attack forces them to flee the front line. Realising they could face a court martial, they must attempt to make their way to a US forward observation post and re-enter the conflict. Along the way they meet two army deserters: a would-be Italian partisan and an injured German officer tired of war. Together they form a strange band of deserters. When they have to cross the dreaded Road 47, the most feared mine field in all of Italy, they must work together with these two former enemies and find safe passage across the deadly terrain and ultimately achieve redemption.